Our ‘renovations’ seem to be dogged by problems. Two days after Guy left for his holidays the electricity went off just as I was about to get up. This is rather annoying as the bathroom is a ‘pièce noir’ (no windows) and without electricity the pump for the well doesn’t work and neither does the central heating. Usually it’s a case of pushing up the ‘trip switch’ but this time it refused to stay in position. While I was switching the water over to mains Bear found a torch and hogged the bathroom. He wouldn’t normally get up early but he had an appointment with the reumatologist for 9.30. The problem was that the garage door opens by electricity and if you pull it up manually you have to get it up high enough for the car to get out (I’m not tall enough) and hold it there (not strong enough). I tried several taxi firms but they were all ‘complet’ – or, in other words, not keen to tackle the road in and out of town due to the roadworks. “You’ll have to cancel the appointment” groaned Bear. I re-scheduled his injections for next week and then phoned the electrician who said he’d come as soon as he could but it wouldn’t be till the afternoon. Meanwhile, we decided to play with the switches on the control panel to try to locate the problem. It means switching them all off and then switching back on until you find the one that blows the whole lot. Eventually we found that the culprit was in the kitchen. It was the circuit with the induction hob and several sockets. But. at least, we had the power back on everywhere else. 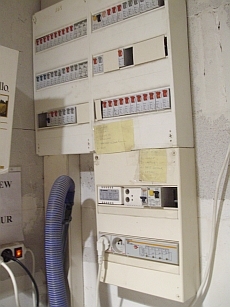 When the elctrician came he checked all over the house, including the attic, and decided that the hob was not to blame. We brought down a portable electric hob from the attic and, fortunately, the oven is still working. But, the following morning, when I went to empty the dishwasher, it hadn’t done anything – and, worse still – the freezer was off. There was a frantic search for extension leads and after what seemed like ages – and a few arguments – Bear and I plugged it into a socket in the next room before the contents had time to thaw. 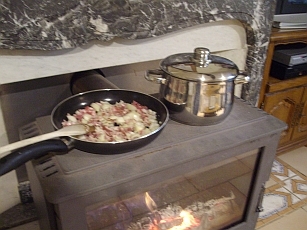 Let’s hope no more sockets decide to go out of action but, just in case, I’m trying out cooking on the woodstove. Last August we made a start on redoing the kitchen. Cc painted all the doors, we chose a new sink, tap and worktop and ordered tiles at Leroy Merlin. Pascal came to fit the worktop, sink and tap and made a bit of a mess of it. Then he decided to take a week off before doing the tiles. But he never came back – even though I owed him 10 euros. Then, at the end of October we found another neighbour – a qualified plumber – who agreed to take on the job. Guy was neat and methodical and we couldn’t help but compare him most favourably with Pascal. However, someone’s arithmetic was awry and he ran out of tiles before the end of the job and we had to order some more. Meanwhile, CC noticed a leak in her shower room and that became a priority so Guy has spent the last three weeks working virtually full time and even some weekends to completely gut the old room and start afresh. CC has been longing for her dream ‘bathroom’ but her plans were thwarted. She chose a shower but found that it wasn’t quite what she expected when it came home. She thought the fittings looked ‘cheap and nasty’ and hadn’t realised that there were jets as well as flexible and over head shower facilities. Then she had problems getting floor and wall tiles as her first choice was either unavailable or would take weeks to order. 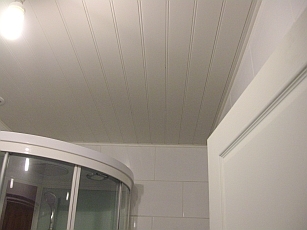 Guy offered to lower the ceiling to make it neater but we hadn’t realised he meant using ‘lambris’ – PVC panels – until it was too late to go back. The only real success story is the sink unit which is what she really wanted. 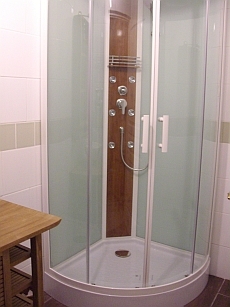 The shower: pity the green doesn’t match the tiles. 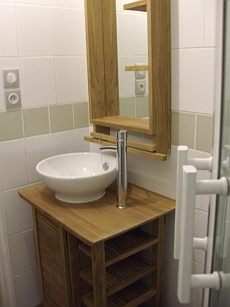 It was hard to find a round washbasin. The fashion seems to be square nowadays. 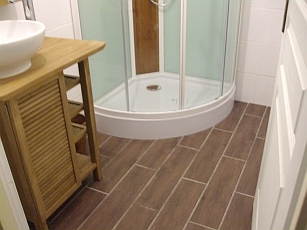 We’re really pleased with the wood effect floor tiles. The room seems bigger than it was before and, despite the setbacks, both CC and I like it better than we thought we would. Guy has gone away for a couple of weeks of well deserved holiday. Maybe – just maybe, the kitchen will be done in time for Christmas. It’s no good, I couldn’t face the execution process all over again and, besides, the end result was far from successful so I’ve given the rest of the boys away. Hugue, at the local brasserie said he’d have them and so I decided to catch the first one outof the coop each morning and put him in a cat basket to take to Hugue. The first morning was OK apart from a lot of squawking but the next time they were mighty suspicious of me – even reluctant to come out for breakfast. But greed got the better of them eventually and I managed to catch two and put them in cardboard boxes. After that things deteriorated rapidly. It rained incessantly, turning the chicken run into a mudbath which smelt strongly of poo; the worst bit being the puddles right outside the coop. I didn’t relish the idea of falling over in wet chicken poo while trying to grab a reluctant bird so I decided to wait until it dried out a bit. The rain set in. The chickens became bedraggled and smattered with brown and also kept their distance even for food. I explained about the difficulty of catching the rest and she said she’d bring Maurice round to catch them this morning -” not too late or he’ll be tipsy”. So at nine sharp she turned up with Maurice in tow and three cardboard boxes. I had fed the chickens but kept them in their house this morning in the hope that it would make Maurice’s job easier. He didn’t wait for them to emerge; he leant inside and grabbed the first one by it’s feet. There were loud protests but, between them, he and Francoise managed to shut the box. The next one put up a fight and pecked his hand so I went to fetch some gardening gloves. Poor Maurice had quite a struggle but he managed to extricate number two and stuff him unceremoniously into the second box. Hilda, the hen, managed to escape and ran down the garden leaving the last cockerel to make a stand. And he was very successful at holding out as long as possible. In fact, I almost relented and thought about keeping him but then I imagined more baby chicks growing into huge tough birds and my heart hardened. No, I did not want to go through this again. After what seemed like an eternity Maurice got hold of Number three and tucked him securely in the box. They were stowed in the boot of Francoise’s car and off they went. I left it a while before taking some more food up to the hens and persuading Hilda to go into the run with Susie, Peggy, Gertie and Daisy. They didn’t exactly make her welcome but they didn’t fight her. She’s bigger than they are but very timid. I’m pleased to report that tonight, all five were happily snuggled down together in the small henhouse. As for the cockerels, Francoise told me that Maurice had put them in a big rabbit house and they seemed quite contented – for the time being. So it was with a mixture of sadness and relief that I parted with the cockerels and I’m the first one to admit that buying those eight little chicks was an expensive mistake to make. I’ve just learned that none of them will be killed. They have all been distributed to good homes with a flock of hens each. I’m so pleased! 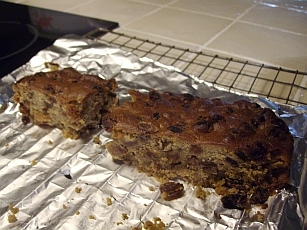 Put it down to age, poor eyesight or downright stupidity but I made a big mistake with the Christmas cake recipe this year by misreading ‘lbs’ for ‘tbs’ and it wasn’t until I’d gaily poured in a tin and a half of golden syrup and mixed it all up that I realised what an idiot I was. Not wanting to waste all the ingredients I added more flour and some ground ginger and baked the mixture in two flattish tins. While they were in the oven I proceeded to make the cake mixtureall over again -this time using one and a half tablespoons of syrup. The ‘accidental’ cakes turned out much better than expected and CC took one of them to share with her students on Friday morning. It went down surprisingly well. The only problem is that several of them asked for the recipe.